Pepper spray is probably one of the most commonly known non-lethal tool used by women for self-defense. In fact it is used by law enforcement, mail carriers, hikers, sports enthusiasts. 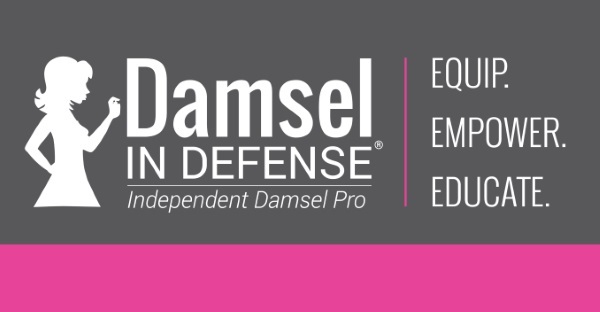 Though it is a commonly known tool for self-defense, most people do not know what this product is exactly. Pepper spray or also known as OC spray is a lachrymatory agent. This means that this spray will make your eyes tearful. The spray ingredients are based off of an oil called oleoresin capsicum. The inflammatory agent in the oil is the capsicum. The ingredient of capsicum oil is the same ingredient that can be found in the chili pepper. The Scoville Heat Unit Tool Scale is used to measure the heat of peppers. To give an idea of the heat of pepper spray picture this; on the Scoville Heat Unit Scale a bell pepper is rated as a zero, jalapeno peppers score from 2,500 to 5,000. Commercial pepper sprays rate at 2 million, and police sprays rate at 5.3 million. There is also a spray used when in the wilderness by outdoor enthusiast called bear spray, this bear spray only has a concentration of one to two percent. Law enforcement pepper spray contains ten to thirty percent of oleoresin capsicum. These are just items to give an idea of the general potency of the different products on the market. One item that many commercial pepper sprays are now containing is an UV marking dye or other type of marking dye. This is used to identify attackers after the attack has happened. When a black light is shown on a person that was hit with the pepper spray the dye will glow. Most of the dyes stain the skin and stay on the skin and remain visible under a black light for a week’s time or longer. This is a helpful tool to aid law enforcement in finding attackers after situations arise. burning sensation, followed by eye pain and temporary blindness. These effects last typically thirty to forty -five minutes. This is a rough estimate and it depends on how strong the concentration in the solution that is being used. That is why in any situation it is important to spray and run. 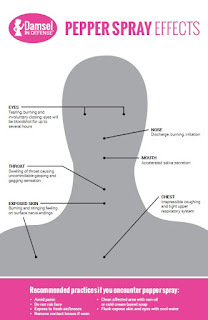 Other effects from pepper spray are burning throat, wheezing, dry cough, shortness of breath, gagging, inability to breath, or speak. Sometimes it causes cyanosis (bluing of the skin due to lack of oxygen). Due to the main ingredient being an oil it is not something that you can just throw water on and call it good. Though water will offer a slight temporary fix from the burning and uncomfortable effects of pepper spray, water does not dissolve oil . There are special wipes at most emergency rooms that can be used to clean off the pepper spray. Pepper spray is a very effective tool in aiding women in self-defense. It can stop an attack before it escalates. Pepper spray can take an attacker down giving a head start to get out of the situation and get to safety. Pepper spray is definitely a women’s self-defense product that a women should consider carrying on her to aid in self-defense.